All ramen is good ramen when you’re craving warmth in your belly. 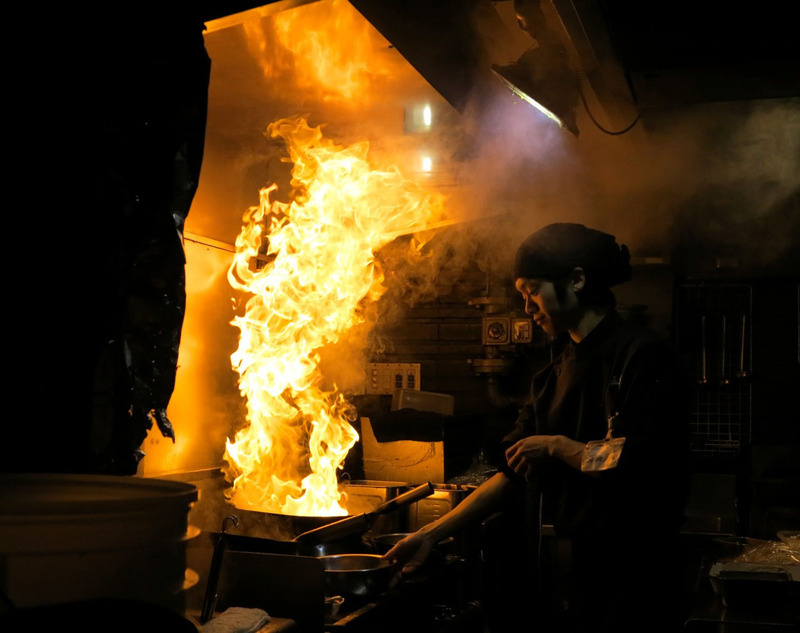 But you won’t find a noodle shop in town that fights the cold in more dramatic style than Gogyo. Not that it looks much like your average ramen joint. Spacious, comfortable and easy-going, Gogyo appears and operates more like an izakaya tavern. It has a good menu of appetizers, sake and shōchū, and there’s no pressure just to slurp and run. Nonetheless, it’s the noodles that everyone comes for. Gogyo’s secret weapon is kogashi (“burned”) ramen. For each bowl, a couple of ladlefuls of lard are heated up in a wok and then ignited, filling the kitchen with billowing fire and smoke. 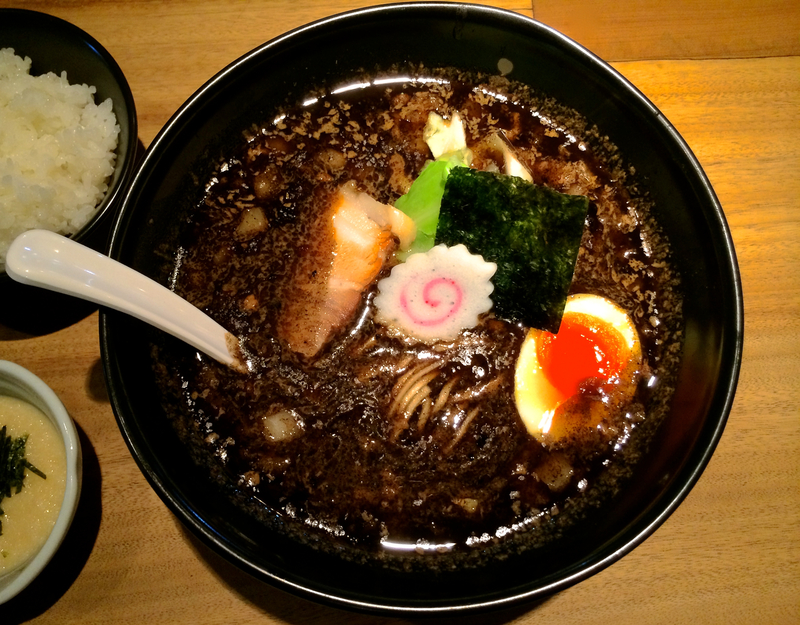 The charred residue is then tipped over the noodles, giving the thick soup — seasoned with either shoyu or miso (my favorite) — a deep black hue and a rich, smoky flavor. 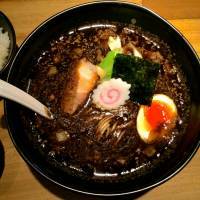 To the ramen cognoscenti, Gogyo is more a curiosity than a holy grail. 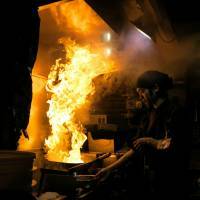 Even so, it still never fails to amaze first-time visitors or to amuse the many regulars who like to drop in for late-night drinks and noodles after a session of drinking or clubbing in Roppongi. Until last autumn, there was another Gogyo in Yoyogi-Uehara, but it has been turned into a branch of Ippudo (the parent company). Now the only other places in Japan to try this highly distinctive take on ramen are in Kyoto (075-254-5567) and the Fukuoka original (092-735-4152). 1-4-36 Nishi-Azabu, Minato-ku, Tokyo; 03-5775-5566; www.ramendining-gogyo.com; open daily 11:30 a.m.-4 p.m. and 5 p.m.-3 a.m. (Sun. and hols till midnight); no smoking; nearest stations Nogizaka, Roppongi; ramen ¥850; major cards OK; English menu; no English spoken.